A Short Call Options, also known as Naked Call Options strategy, involves the sale of a call option. Selling option is also known as “writing” an option. Outlook: When you short (sell) a call options, your outlook is bearish or neutral. You are not expecting the price or volatility of the underlying stock to increase significantly. Limited to the amount of premium collected. Time erosion of options values help writer of call option. Requiring less capital than shorting the stock outright. Does not require capital outlay and can earn interest while you trade. Unlimited risk to the upside of the underlying stock. Potentially may loss more than the amount of premium collected if the strike price, expiration dates or underlying stock are badly chosen. Buy back the call options and close off the position at a profit. 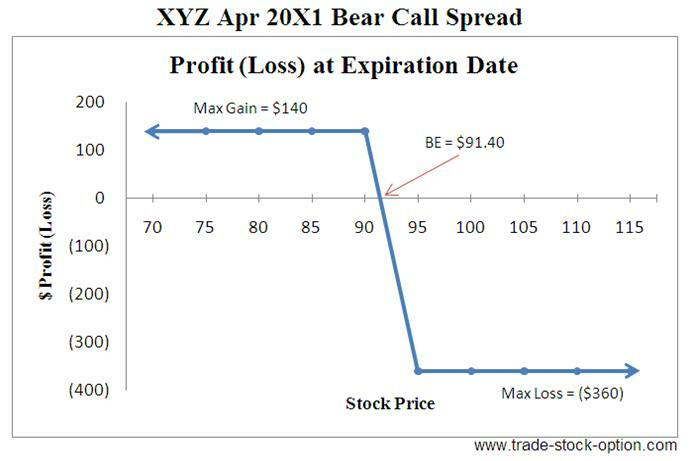 Buy a lower strike call of the same expiration date and create a Bear Call Spread Strategy. Time decay will erode the value of the option everyday. Assuming all other variables being equal, option seller (writer) will be able to buy back the option at a lesser value then what has been paid initially. 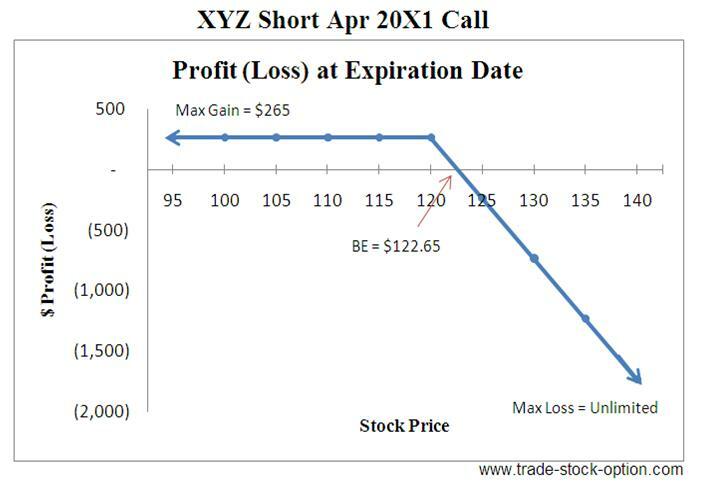 Assumption: XYZ is trading at $118.57 a share on Mar 20X1. 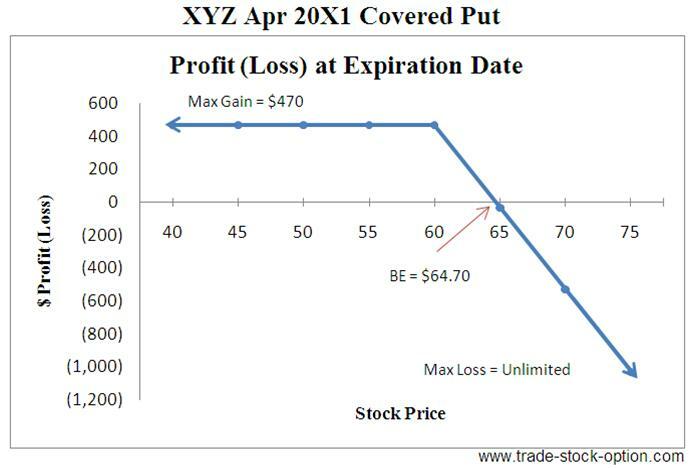 You are expecting share price of XYZ to drop or move sideway. In this case, you may consider to sell one Apr 20X1 $120 strike call at $2.65 to profit from the bearish or neutral outlook of the stock. Note: commissions are NOT taken into account in the calculation. Maximum Reward = $265 (premium collected). Selling an option does not require you to be precise on the direction, timing or magnitude of the move and you enjoy the benefit of time decay. An option writer can also structure the naked call in a way to enjoy a higher statistically probability of success than shorting the stock or buying a call option. Option is a wasting asset and time decay (in your favor) accelerates exponentially in the last month before expiration. To get better trades than shorting the stock itself, do ensure that you give yourself as little time as possible to be wrong. Generally this means that you should only short options that expire in less than 1 month. One important point to take note is that if you short a call and is assigned, you will be forced to short the underlying stock at the strike price. In order not to be forced to short a stock that is rising and exposed to potentially unlimited losses, only select the strike price around an area of strong resistance within the context of falling trend. 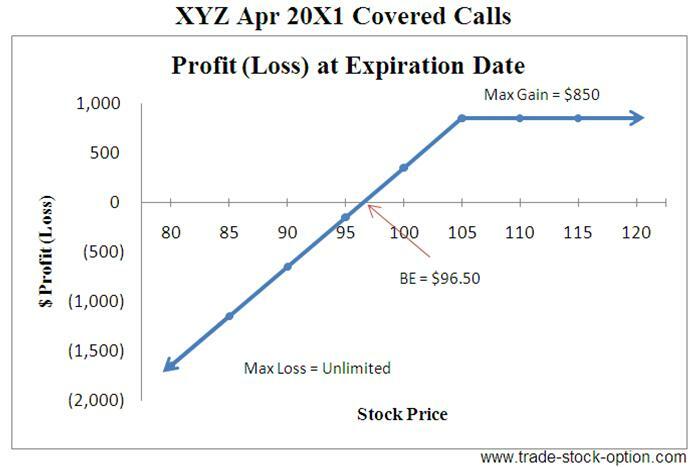 Although this is one of the simple stock option strategies to execute, shoring a call options (without any risk management features) is a risky strategy as you are exposed to unlimited losses if the stock rises. A single loss from this strategy can wipe out a few years of profit from shorting option. Most of the brokers will only allow experience traders to trade this strategy. As such, this is not a strategy that I would recommend to an inexperience trader. 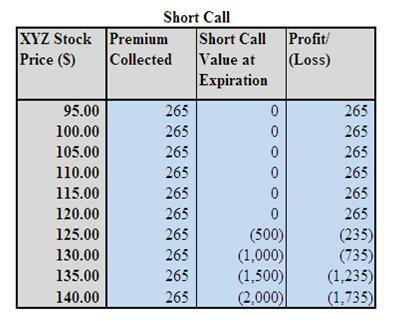 You should pick the strike price and time frame of the short call options according to your risk profile and forecast. Selecting the best strike price at the appropriate time frame is a balancing act between collecting as much premium as possible while keeping the risk exposure to the minimum. Next go to another bearish strategy, Covered Put, to learn how profit can be make from a bearish stock.